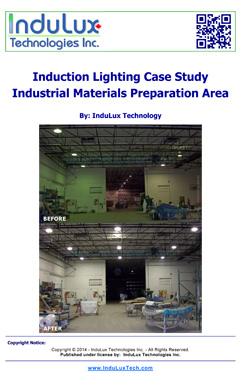 InduLux Technologies offers you a selection of papers on Magnetic Induction Lighting technology, also called Induction Lamps or Induction Lights, is currently one of the longest lifespan types of lighting available! While this technology has been surpassed in energy efficiency by LED lighting, there are still applications where Induction lighting is useful. The papers in our library provide information and education on various aspects of Induction Lights. 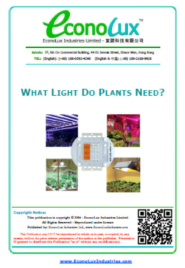 This is an example of a paper we were commissioned to produce for EconoLux Industries, about plant/grow lighting and the spectrum needs of plants grown under artificial lighting. Agricultural (or Horticultural) lighting (grow lights), are widely used in greenhouses, or indoor controlled environments such is 'vertical farms' with no natural daylight; to either replace, or augment, natural sunlight (daylight) in the growing of many different types of crops. These crops can include, peppers, tomatoes, leafy greens, herbs, flowers or medicinal plants. In many cases, the most popular type of lights used are HID (Metal Halide or High Pressure Sodium) lamps. These lamps are generally deficient in spectrum of the light delivered to the plants, and the electrical energy needed to operate the plant/grow-lights is a significant amount of the input cost involved in the production of the crops (compared to properly designed LED grow-lights). This paper discusses the various curves used to quantify the light spectrum, especially the McCree curve, that is most desirable for plant cultivation. NOTE: These papers and publications can be customized with your logo and contact information to provide educational and informational materials for your customers and staff - see our Products page or please Contact Us to get details. If you wish to use these materials "as is" you are free to do so, provided that source identification remains intact (the files are not edited or changed in any way), and the copyright notice remains intact. 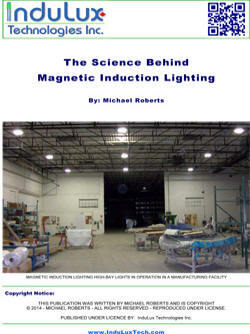 This 28 page paper (PDF) gives a comprehensive overview of Magnetic Induction Lighting, how it works, a discussion of human vision, detailed information on S/P ratios and Visually Effective Lumens (VEL), the psychological effects of light, etc. There are numerous citations and quotes from scientific papers which show that current lighting measurements do not accurately reflect the needs of human vision and how Induction Lamps (and LED lights) can fulfill those needs in an energy efficient manner. A brief overview of environmental issues shows that Induction lighting is a green lighting technology which can help reduce CO2 emissions thereby helping to reduce global warming. 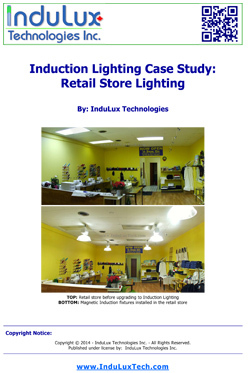 The paper includes many graphs, charts and photographs to give the reader added insight into Magnetic Induction Lighting technology. References are included for those who wish to follow up on the original papers cited in this publication. This 8 page paper (PDF) provides an introduction to Induction Lamps with a brief overview of a history of lighting, and a section detailing how some common conventional lamps work. 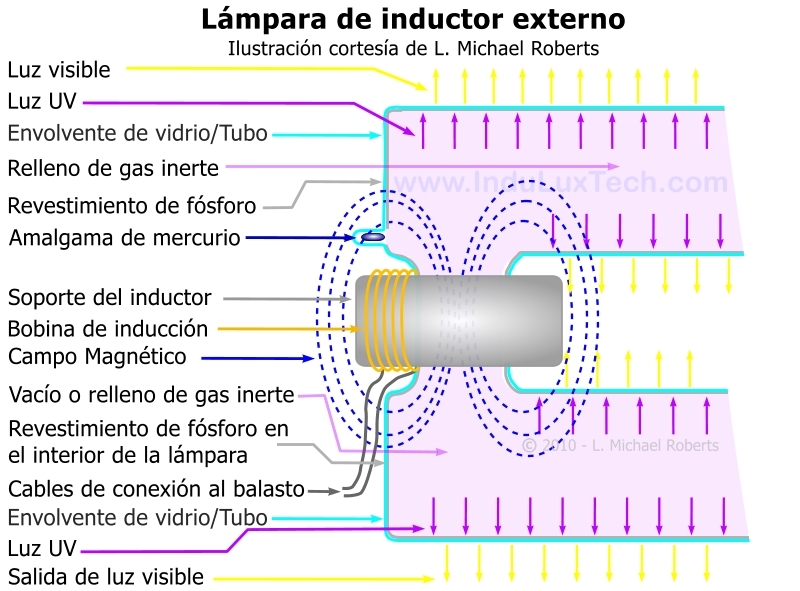 Extensive information, with diagrams, on how both external inductor and internal magnetic induction lamps operate is provided, so that the reader will become familiar with the inner working of induction lamps. 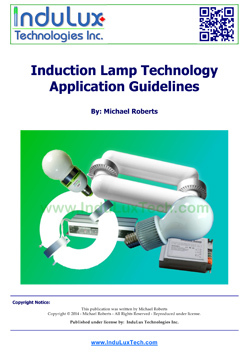 There are some example induction lamp applications, and a summary section providing the advantages of induction lamps. Graphs, charts and photographs give the reader added insight into the technology. 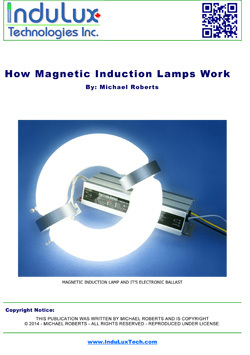 How does Magnetic Induction Lighting work? 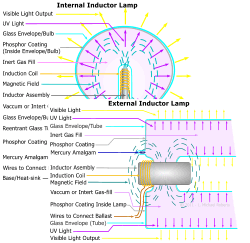 Why do Magnetic Induction Lamps last so long? How does Induction Lighting save energy and money? Is Induction Lighting environmental friendly? 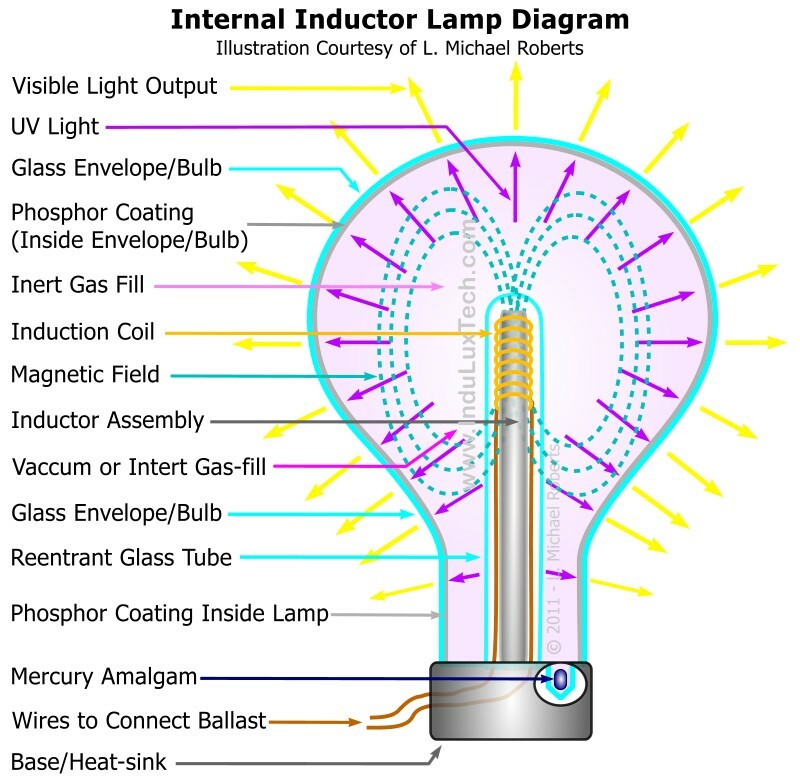 What are the main types of Induction Lamps? Are dedicated fixtures required for Induction Lamps? Are Induction Lamp fixtures affected by temperature? Where can Induction Lights be used? 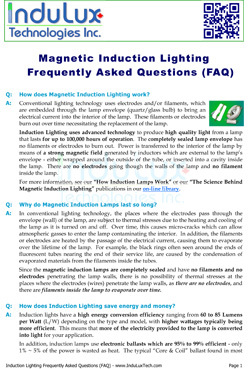 The answers to these, and may other questions about Induction Lighting are here in the PDF version of our FAQ. In an time when there is growing concern about Global Warming and Climate Change, and a desire to reduce our environmental footprint, individuals and business are seeking ways to reduce their environmental impact - to "Go Green". 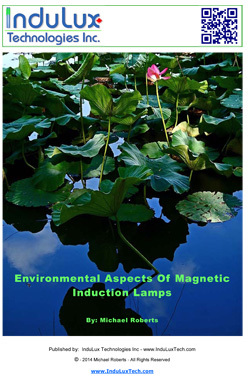 This 16 page paper, with many illustrations and tables, considers energy efficient lighting, particularly Magnetic Induction Lamps, as a way to implement an environmentally friendly technology. Induction Lamps are a green lighting technology that can reduce environmental impact in several areas such as saving energy, reducing CO2 (greenhouse gas) emissions, reducing global warming (climate change), reducing Mercury consumption, and improving recycling issues. Reducing the environmental impact and "carbon footprint" of your operations may be more feasible and financially viable when implemented as a series of small incremental steps rather than as a large project. One of the often overlooked areas, where it is both simple and financially feasible to make improvements, is in green lighting systems. In light of many questions regarding the merits of internal inductor lamps Vs. external inductor lamps, high frequency and the low frequency ballasts available to drive them, RFI (Radio Frequency Interference) and various lamp colour temperatures (Kelvin); it is sometimes confusing to determine which of these is the right choice for a particular induction lighting application. This 8 page guide attempts to summarize the pros and cons of each induction lighting technology, in a simplified manner, so as to provide some general guidance for selecting the best induction lighting technology for your application. A composite materials and structures fabrication company, is located in an older industrial warehouse, with high ceilings. The pre-production area, where materials are measured and cut, was poorly lit by old mercury vapour (MV) High-bay fixtures. The 12 inefficient MV High-bay fixtures were replaced with 15 Magnetic Induction Lamp based High-bay fixtures, and the incandescent security lights were also replaced with low-wattage Induction Lamps. In summary, electrical load was reduced from 4,100W to 3,168W - about a 22% energy savings; Average light levels were improved from 130.3 to 257.5 Lux - about 98% brighter; and when adjusted for S/P Ratio, the new lighting produced 417.4 VEL - about a 300% increase in VEL! This 6 page case study provided diagrams, detailed light measurements and before and after comparisons of energy consumption and light levels. A small custom embroidered gift store, was poorly lit with recessed fluorescent troffer fixtures. Staff complained they were having problems seeing fine needlework and matching colours. The fluorescent fixtures were disabled and new Magnetic Induction lamp Low-bay fixtures with prismatic shades were installed. Improved placement of the induction lamp fixtures eliminated operator shadows at the sewing machines. Incandescent halogen track-lights were replaced with LED lamps. In summary, the new magnetic induction fixtures and LED lamps provide much smoother, glare free lighting, at higher light levels, with improved colour rendering and significant energy savings. Electrical load was reduced from 1,150 W to 717 W - more than a 37% energy savings; Average light levels were improved from 365.8 to 595.5 Lux - more than 55% brighter! This 8 page case study provided diagrams, detailed light measurements and before and after comparisons of energy consumption and light levels. 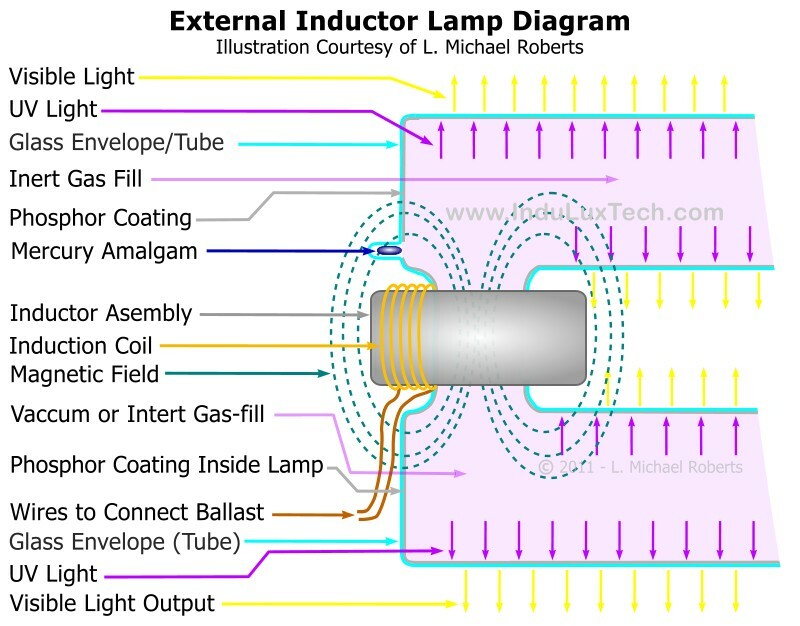 Our Internal and External Induction Lamp Illustrations are popular and used by many people (and even plagiarized by a few). Unfortunately, some have taken the illustrations from PDF files or other sources where the quality is degraded. We are now making these illustrations available, in high resolution JPG versions, for use on your web site, and in your presentations and publications - subject to the terms of the license below. LICENSE: The illustrations are copyright © 2008~2017 by InduLux Technologies. You are hereby granted a license to use these illustrations on web sites, in presentations and in publications PROVIDED that you do NOT alter/edit the images in any way (except for re-sizing them), and you do NOT change the file names. Enjoy! 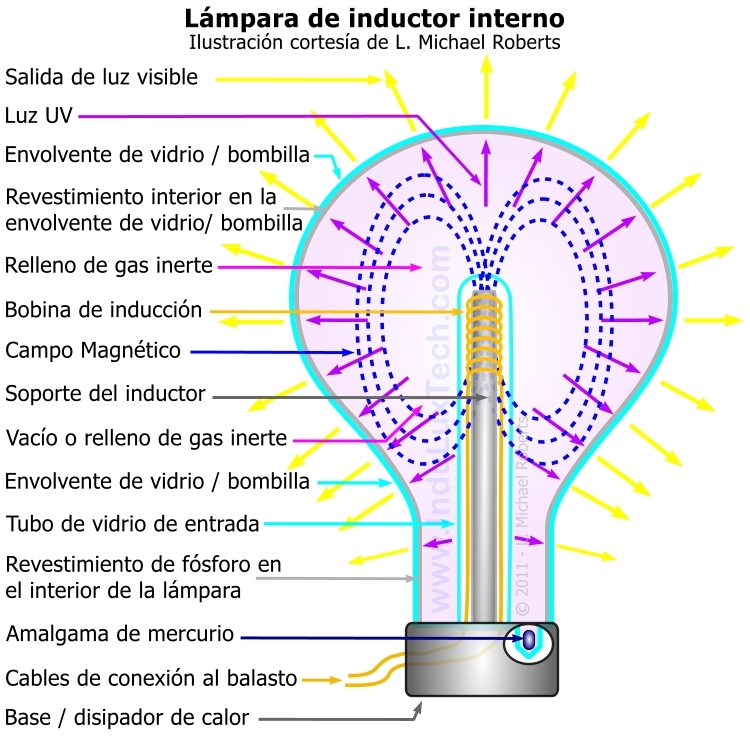 Nuestra Ilustraciones de inducción interna y externa de la lámpara son muy populares y son utilizados por muchas personas. Ahora hemos hecho estos diagramas disponibles en versiones JPG de alta resolución, para su uso en su sitio web, y en sus presentaciones y publicaciones - sujeto a los términos de la licencia a continuación. LICENCIA: Las ilustraciones son de derechos de autor � 2008~2018 por Michael Roberts. Presente se le concede una licencia de uso de estas ilustraciones en las p á ginas web, en presentaciones y en las publicaciones siempre que no alteren / editar las imágenes en modo alguno (excepto para cambiar el tamaño a), y no cambiar los nombres de archivo. Disfrute!